The 5th annual Run for LITTLE Hearts is Kansas City’s exclusive CHD (Congenital Heart Defects) Awareness Event! This year's event will take place on Saturday, June 23, 8 am - 12 noon at Arrowhead Stadium in Kansas City, MO. In 2017, more than 2,000 people participated in the 5K, 10K, 1 mile memory walk, and Kids' Dash while visiting fun and educational booths at the lively pre- and post-race expo. Race proceeds benefit the CHD Babies Fund for Research at Children’s Mercy Hospital. Funds will also support local families affected by CHD and fund youth heart screenings and a free medically-supervised summer camp for local kids born with heart defects. 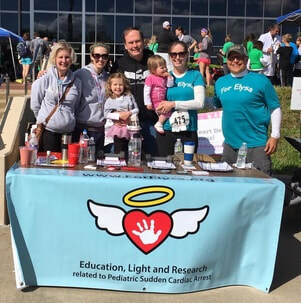 If you're participating in the run, consider joining our For Elysa team! (You'll have an opportunity to join a team during the registration process.) And once again, we'll be hosting an informational booth about myocarditis, warning signs of potential cardiac compromise in otherwise healthy individuals, and our foundation's efforts to address pediatric sudden cardiac arrest. Hope to see you there!